Located in a lovingly restored 1930's RC Cola bottling plant, Cola's is a "casual" fine dining bar/restaurant specializing in seafood, steaks and other culinary creations influenced by a broad range of ethnic cooking. There is an emphasis on fresh ingredients and locally grown food where possible. Weather permitting, two garage doors open up the restaurant to views of the Statehouse and allow our guests to enjoy the bustle of downtown Columbia. 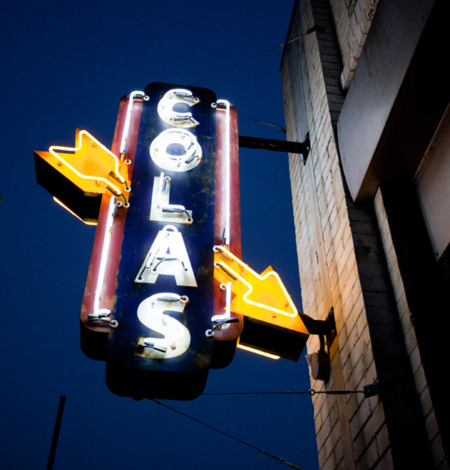 Cola's boast a 40 foot long bar that houses our extensive wine selection. If preferred, try one of our house cocktails or choose a brew from our large selection of bottled beers. Cola's has ample room to host your private functions in either of the two private dining rooms, seating up to as many as 50. Large booths adorn the main dining room and there is table seating for small and large parties.